Don’t miss your chance to see the latest Martina Liana Gowns at Patsy’s Bridal Boutique July 22 and 23. Get a sneak peek of gowns that have not even come out yet! This will be the first time for brides to see what Martina Liana has coming out at the next market and buy before anyone else! Plus brides will receive 10% off their purchase! The Modern Art Museum of Fort Worth is offering an amazing promotion! Book your wedding before September 1 and receive free silver chiavari chair rental for up to 200 guests! Contact them today for more details, 817.840.2175. The Bridal Salon at Stanley Korshak is hosting an amazing trunk show! They will be featuring Lovely Veils and Headpieces with Fiona Wysocki on July 29-30. Be sure to mark you calendar and call, 214.871.3611 to make you appointment today! Summer bridal show season is just around the corner! The Dallas Bridal Show is July 30-31 at Dallas Market Hall. We will be sharing complimentary copies of Brides of North Texas’ brand-new Fall/Winter issue! Stop by and say Hi, and be among the first to lay eyes on our amazing new issue! 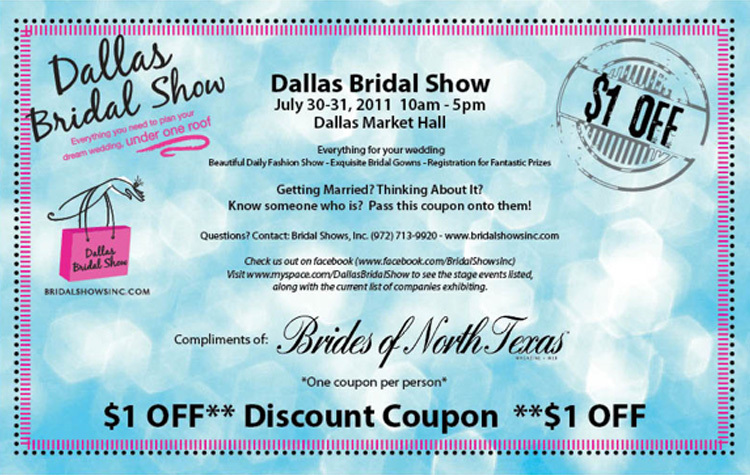 Click on the graphic above to print and save $1 on entry, compliments of Brides of North Texas! The Treasures of Stardust “Sample Sail” starts this week! The sale begins July 21 and goes through July 26, but there will be a special event in store on Saturday, July 23 that you won’t want to miss! Stardust Celebrations will have a photo-booth in store provided by F8 and Captain Jack Sparrow provided by Randal Stout Entertainment. Brides will be able to take all kinds of fun pictures with Captain Jack in the photo booth. The sale includes 10% off all new bridal gowns; Jewelry, shoes, veils, invitations, up to 75%; From $50 on cocktail and bridesmaid gowns; From $300 on Mother of the Occasion gowns; and some sample wedding gowns up to 50%. Be sure to swing by Stardust Celebrations in Plano during this incredible promotion, and call 972.781.1619 for your appointment today!